These are comprehensive landscape conceptualization, design and installation services. We provide end-to-end solutions to customers and these include- hardscaping, softscaping, paver installation, fire feature and water feature installation. We use the best materials and workmanship in our projects and this ensures you have stunning, durable outdoor spaces. Most people are strapped for time and find very little or no time to tend to their lawn spaces. We provide excellent synthetic grass installation that is done to the highest standards. Not only is the installation quick, but this low-maintenance solution proves to be a value-add to your landscaping. It’s a far better option compared to getting sod installation. Depending on the design concept of a landscape, we can design and construct Celtik and Castle Walls in your garden or yard. We also handle retaining wall and concrete block wall construction projects. These are specially-engineered walls that lend support to the landscape and help prevent soil erosion too. Every landscape has some or the other type of hardscaping. We have highly experienced stone masons that can handle the construction of different types of stone features in your landscape. 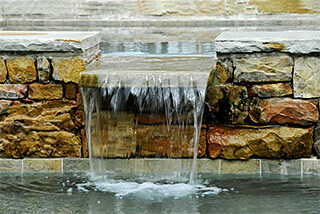 We also install natural stone veneers on concrete retaining walls, boundary walls as well as on outdoor kitchen walls. Our company also handles travertine paver projects in an expert manner. Water features add a very unique look to the landscaping. It helps to balance out features such as fireplaces, fire pits and other masonry elements. We can custom design and install features such as fountains, ponds and waterfalls made of various materials and are constructed in styles that will complement the look of your yard. An outdoor kitchen is a very popular feature in residential landscaping. We can construct this in a patio or deck space or build one in any other part of your yard too. This kitchen design can be as elaborate or simplistic as you want it to be. Most clients like to have some fire element in their landscape. It helps create a very warm and comfortable atmosphere in the outdoor spaces of your home; and makes them more usable even when there is a nip in the air. These features could be built using brick, natural stone or concrete. The latter can also be finished with stone veneer or stucco as required. The only way you would be able to enjoy the landscaped areas of your property, even after dark, is to get garden landscaping installed. 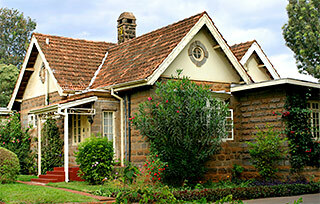 This adds to the ambience as well as the security aspect of your property. We make use of energy-efficient LED lighting and low voltage lighting solutions in our work. There are times when the land on your property isn’t as leveled as required to construct features such as an outdoor kitchen, deck, patio or even a driveway, pathways etc. In this case, the space will have to be excavated and all the debris will have to be hauled and transported away from the premises. We provide customized excavation and hauling solutions. Some people don’t like very elaborate or permanent features like outdoor kitchens in their yard. In this case, we can design and build different types of outdoor features such as pergolas, arbors and gazebos. These create a very charming look on your property. Concrete is a very extensively-used material in landscaping projects. Today, this material isn’t considered to be boring or dull. We can provide solutions such as acrylic overlays, epoxy flooring as well as acid-stained concrete floors. These can be used in any part of the landscaping. There is something amazingly classic about wrought iron. It looks stunning and when it’s designed well, elements made of wrought iron, like gates and fences add a very elegant and sophisticated look to your property. We provide customized wrought iron fencing and gate designs based on your specific requirements. When it comes to landscape design, customers like to know exactly what their gardens and yards are going to look like, once they have been installed. We provide 3D design consultations as part of our landscaping services. This helps give our customers a very clear idea about what the final product will look like. They are able to request changes at the design stage, which prevents later, expensive changes. Every landscape has a certain number of plants, shrubs and trees. It’s crucial that these be chosen with care. We source all plant materials and trees from the best nurseries; this ensures your landscape will be healthy and look good at all times. We also help you choose the right kind of annuals and perennials as well as the right kind of bushes and plants. Many of our customers like to add the fun quotient to their yard by adding an in-ground trampoline to it. We can provide the size of trampolines you need and will ensure that the installation is carried out to manufacturer instructions. These are a very safe option compared to ones that stand at a certain height above the ground. For any more information about the different services we provide, speak with the Scapes and Stones experts at this number 702-278-3228 and give us some more details about your project. You can also contact us through our online form and we will respond shortly. With us, you are always assured of top notch solutions at very competitive cost.